Gen. Ross: As far as I'm concerned, that man's whole body is property of the U.S. army. So the logic for making this movie must have been: At first you don't succeed, try try again. 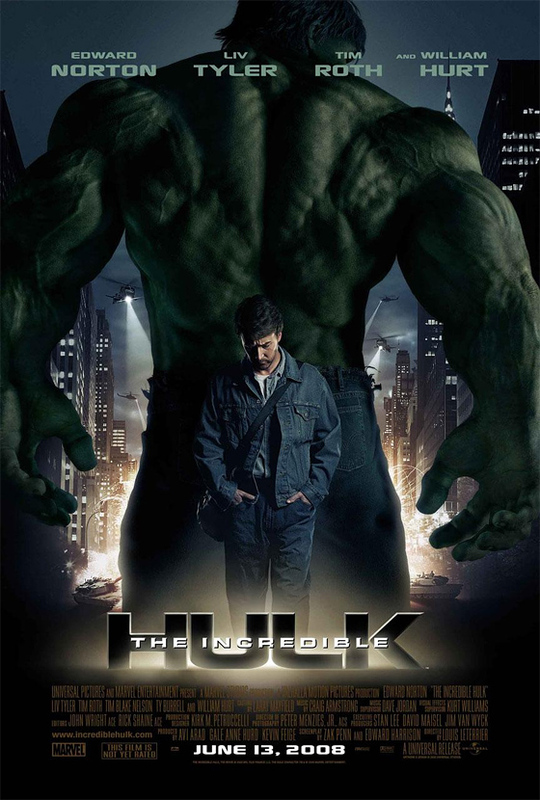 After the 2003, Ang Lee-directed Hulk, which I found to be visually interesting and fairly ambitious, despite the over emphasis on the father-son dynamic and spotty CG, this new vision of the Hulk actually returns the characters to a route much more similar to the comics and the old TV series. It plays well as a fun B-Movie, chase thriller-type, which happens to be set in the Marvel universe and it works. 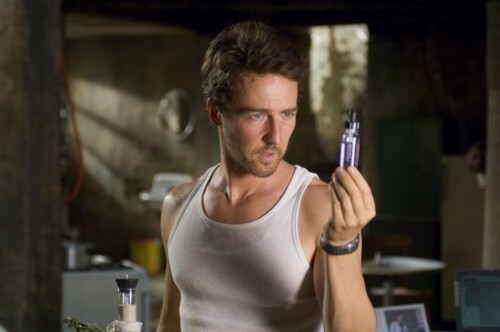 Edward Norton is an inspired choice, as he fill the shoes (before ripping through them) of Bruce Banner, the cursed scientist/fugitive hoping to possibly find a cure for his furious alter ego. After a brief recap during the opening credits, to show an origin story, which works in getting around having to go through the same motions as well as severing ties to the first film, we pickup with Bruce living in seclusion in South America. He does some day labor work and goes to anger defense classes, as well as chats anonymously online with another doctor about finding a cure. The jig is soon up, however, as General Thunderbolt Ross, played very well by William Hurt, finds Banner's location and sends a team after him, including a special forces soldier, Emil Blonsky, played of course very evilly by the always cool Tim Roth. Bruce Banner: Don't make me hungry. You wouldn't like me when I'm...hungry. Wait, no, that's not right. After some chases and a Hulk manifestation, Banner finds himself back in America, where he eventually finds his only true love, Betty Ross, played by a sweet and warm Liv Tyler. However, Gen. Ross' soldiers persist in going after Banner, putting him constantly on the run. Ross eventually does the unthinkable (which, in a comic world, is always the right choice) and injects Blonsky with a super soldier serum, leading to his change into the dreadful Abomination. Banner realizes that it will come down to his own monstrous affliction to stop it. This movie succeeds by putting together an A-list cast into a B-movie-oriented action structure. It is very entertaining, sticking to the man on the run roots very familiar to the TV series (and watch for some cameos from that, as well as a perfect Stan Lee role). The plot this time around seems very fitting and ultimately the kind of Hulk movie that the majority of people would want to see. Director Louis Leterrier, of The Transporter series and Unleashed fame, does a good job at establishing a world in which has both comic elements and the status of a somewhat real world in which the Hulk could live in. He also makes great use early on of the Brazil location. The screenplay, developed by comic movie scribe Zak Penn and Norton himself, lends itself to containing all the elements you would want in a summer action movie. Then you have the Hulk itself. The creation is very good. 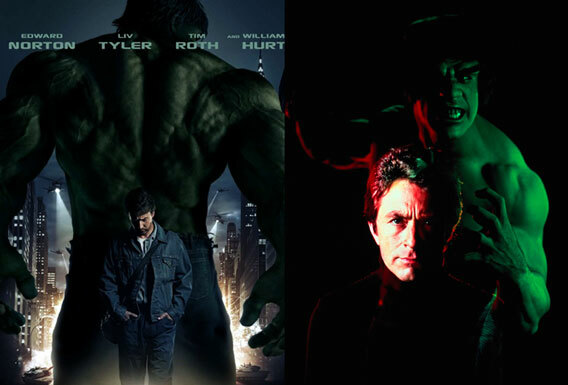 Its size is consistent, which is nice, but a little out of step, because the Hulk does get larger as he gets angrier, as in the comics, but at least its not all over the place like in the 2003 film. But the Hulk himself looks very good. 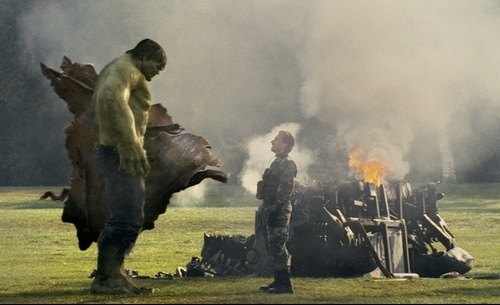 The film even puts in some signature Hulk moves, which I found to be awesome. The final fight between Hulk and Abomination is certainly worthy of the "Transformers Ultimate Destruction of Cites" award. Abomination: Give me a *real* fight! This whole film is a very good step in the right direction and worthy of its Incredible claims. The cast is solid. The pace is quick enough for things to get down to business quickly. And the general tone feels fitting of the type of movie this should be. The Incredible Hulk gets down to basics and works well enough for it. I didn't care for this movie all that much, sorry, Aaron. I would give it 2.5/5. The opening sequence with the credits was great, but I found a lot of the rest to be a bit silly. The special effects didn't really work with me. I was so unentertained, that when the "Hulk...smash!" scene appeared, I was half asleep, shaking my head in confusion. I know I'm the alone on this one, but I much prefer the Ang Lee version, which I found profoundly creative on so many new levels. And the spinoff film of the Bill Bixby TV series. I would agree with you that the Ang Lee version is more creative and ambitious, but I still think it collapses under the weight of its over-wrought story. This flick works for me because it knows what it's trying to be and succeeded well at it.